Fear of Complications or Inspired by Them? I remember the conversations started a few days after I was diagnosed. A throat infection had masked the symptoms and I was admitted to hospital in a DKA coma, I would remain in hospital as the medics brought my blood glucose levels down and I have no memory of those first few days. One of my first memories after diagnosis were of my Nan coming to the hospital to visit me and she told me that one of her friends had diabetes and she had to have her feet cut off because she did not look after her diabetes, that was the first of many negative conversations about diabetes throughout my life. I was just 5 years old and this conversation happened in Basildon hospital in 1977. I am sure that my Nan was trying to make me see how important it would be for me to take care of my health and my diabetes, I could not understand how something that made me use the sugars I ate that had broken in my body was related to the possibility of having my feet cut off but the fear she created in me with her well-intended comments has never really left me. Please don’t judge my Nan badly, in 1977 the impact of psychology on physical health was ground breaking research and had not been adopted by health care professionals or laymen. Tools for managing diabetes did not really exist either, to put this into context there was no self-monitoring of blood glucose, that technology did not exist yet, I was prescribed just one injection per day of an insulin called Monotard, an insulin that was derived from cows or pigs. We soon found out that I was allergic to cow (bovine) insulin and we switched to pig (porcine) insulin which I could just about tolerate. The HbA1c test did not exist yet either, or if it did was not available in my hospital. My expectations of life with diabetes were set at that early stage, it soon became clear that good ‘control’ was important but without any tools to bring about control or ways to measure that control we were unable to make any informed decisions to bring about any form of control, instead we were in a battle for daily survival. As a teenager, I rebelled against my diabetes skipping injections, eating what I wanted, when I wanted, transition care for diabetes did not exist and I refused to attend diabetes clinic for about 10 years before I finally realised in my late twenties that if I wanted to live with diabetes on my terms I had to make some concessions. I could write many stories about growing up with diabetes but in this article let’s move the clock forward to 2006. It is now 29 years since diagnosis, I am married to Denise and we have two daughters and we are now living in South Wales. I am attending diabetes clinic regularly and I have settled into a routine with my diabetes, my family and my life. I decided that I wanted to be an early adopter for an insulin pump and I had worked with my HCP team to make this happen in 2006. 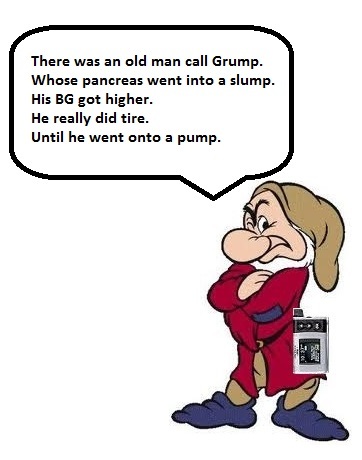 My insulin pump provided me with the tools to improve my diabetes management, everything was good, I felt better than ever, my HbA1c dropped to 7% (that is 53 for all of the newbies out there) and life was treating me well. I have secretly made a pact with myself that I am going to see my great grandchildren, my own daughters are just 4 years old and 2 years old at this time. I had already been told that there are changes in the blood vessels in my eyes that needed to be reviewed more carefully and more often and I had been seeing an ophthalmic surgeon once a year for the past 3 or 4 years. On this day in 2006 I went to see the surgeon feeling surprisingly relaxed, I knew that improving my diabetes management via my insulin pump were going to stabilise the changes in my eyes. After the examination, the surgeon would always chat to me about the changes he had seen, or not, and then we would tell me to come back in a year. I could not have been more surprised that day when the surgeon said that there were significant changes that were threatening my sight since my last appointment. I explained that my HbA1c was better than ever, that I was on an insulin pump and his response hit me like a bolt out of the blue “that explains the changes we are seeing, in people with long term type 1 diabetes who rapidly improve their control we sometimes see significant changes in the eyes”. This felt like diabetes giving me a real kick in the teeth, I had worked my arse off, brought my HbA1c into target range for the first time ever and this is the benefit? The surgeon went on to explain that continuing to maintain, and even improve, my diabetes management was still essential in maintaining my eyesight and that the long term benefits would certainly outweigh the short term ‘bad news’. The surgeon then told me that he needed to perform laser surgery on my eyes and he explained what he would do, how he would do it, what were the risks of doing the surgery and the likelihood that if the surgery was not performed I may experience a bleed that could permanently damage or destroy some or all of my vision. As I began to process this news I asked him when would the surgery take place, I could never have been prepared for his answer when he said in about 10 minutes. I was given another dose of the drugs which dilate the eye and I was asked to go to the waiting room to allow the additional drops to work. My wife and daughters were in the waiting room and as I walked out half blinded by the drugs in my eyes I knew that I wanted to see my daughters grow up and although my own children were only 2 and 4 years old I made a pact there and then that I would see my great grandchildren, I knew then that I would do whatever it takes to maintain my health for as long as possible. The surgery went well and over the course of about 6 rounds of laser surgery my retinopathy was stabilised, the treatment I received was excellent and once I recovered from the shock I knew that the treatment approach was right, find a problem and deal with it immediately. At the time of that surgery I was a 35 year old guy who was carrying too much weight and an active day was walking down the stairs at work, but only if the lift was broken. So, what has changed for me since then? I started to become more active doing some walking (because I really hated running) in the hills and mountains in the UK and I then went on to do the Welsh 3 Peaks challenge and the 3 Peaks challenge, then after too much wine one evening in 2013 I agreed to run a 5k race, did I mention that I hated running?, and this inspired me to train for a run a half marathon. I was now 41 years old, and I thought if I can run a half marathon after living with type 1 for 36 years anybody can do it. On the 2nd of October 2013 I completed the Cardiff half marathon, I never anticipated that it would lead to a phone call from JDRF inviting me to join them for a little challenge and on the 21 June 2014 along with 16 others with type 1 diabetes I watched the sunrise from the summit of Kilimanjaro. Throughout my training to climb Kilimanjaro I continued to run, did I mention that I hated running? I found that my diabetes was easier to manage if I took part in regular physical exercise and running was something I could just about anywhere and this is a huge advantage when your job takes you all over the place. I began to realise that the running was offering me benefits that I could have never anticipated, my blood pressure was now dropping, my cholesterol was dropping, my weight was dropping and I had more energy. These factors all lower my risks of diabetes complications. This year I celebrated 40 years of living with type 1 diabetes and to mark the occasion I ran 40 half marathons in a year (did I mention that I hated running), finishing the challenge in Swansea on 26 June 2017 just a few days before the anniversary of my diagnosis. My running campaign had a number of goals, for me personally it was an endurance challenge that pushed me and my diabetes well beyond my comfort zone but it was more than that, it was a campaign to raise awareness of the symptoms of type 1 diabetes. The next chapter in my story is that my retinopathy remained stable until a few months ago and it has now become maculopathy, I continue to receive excellent care and the situation is being closely monitored. When treatment becomes necessary for my maculopathy it will be dealt with immediately. Will I get to see my great grandchildren? I certainly plan to. However, whatever complications that my diabetes puts in my path I will continue to make every single day count, is that my old fears of complications coming through or is it a realisation that my health is a gift? I am not sure of the answer but I certainly like the results. For the last few months I have been enjoying a rest from the running and investing my time into the creation of the website which is dedicated to type 1 diabetes and exercise (1bloodydrop.com). I am working to create a resource which answers the questions what should I do to manage by blood glucose before, during and after I exercise? We have created video blogs which discuss long distance running, mountain climbing, swimming, weight lifting, football, 5-a-side football and we have some amazing interviews with experts in the field of diabetes and exercise.